macOS Mojave (10.14) was released today, and if you’re like me, you may have decided that dark mode is not for you. Well, I stumble across a site that helped me regain the appearance of High Sierra that I was used to: a light theme with a dark Menu Bar and Dock. However, this method ended up breaking a few apps and generally it didn’t work out the way I wanted, so I reverted. That’s when Firefox started having a fit, visually speaking, and I noticed in the comments (on the site above) that I wasn’t alone. I tried to reply to the user having the same trouble, but I don’t have a Disqus account (and you’re the product) so I’m writing it here in case anyone has this same issue. I didn’t need to log out (or restart), Firefox just started working. I’m actually hoping that dark mode improves over time, or at least that apps better support it. For now, I’ll settle for the default light mode. With the released of macOS 10.13 High Sierra, I did a review of my installed applications to make sure an upgrade would be as painless as possible. One item that caught my eye was Lingon X, which I use solely to remove .DS_Store files via launchd. You can manage this yourself, but Lingon X is so straightforward that it’s easily worth the cost ($10). Note: be sure to replace [user] with your actual user account. Interestingly, I tried using ~ (tilde) to indicate my own home folder, but Lingon X said that would result in an error. Lastly, I selected “Scheduled” and decided to run this every 15 minutes. Everything works as expected, and sometimes, if I’m really bored, I do something in Finder to create a .DS_Store file and, like watching paint dry, wait until my script runs and removes it. I’m so frustrated that I just need to put this somewhere — I’m giving up on Duolingo today after 328 continuous days of using it. They have this thing called a streak, or your total days of continuous use, and so I’ve been using Duolingo every day for 328 days. I’m getting off track, my disappointment has nothing to do with my streak and everything to do with Duolingo’s monetization strategy. They know people have become hooked on having a long streak, so they’ve decided now it’ll cost you to keep it. To be fair, you can earn their virtual currency to retain your streak should you forget your daily lesson a day here or there, but now that virtual currency is harder to earn and the cost of retaining that streak has gone up. Oh sure, they’ll sell you more virtual currency, but why even have virtual currency? I think it misses the point of trying to learn another language. So, I’ve done some research and just now signed up, and paid for, a year of busuu, and so far it’s as good or better than Duolingo in every way that’s important to me. On top of that, I can send my own practice phrases (written or audio) and other users will critique them and provide feedback, and I get to do the same. That feels very gratifying to me. Anyway, I hate to give up the streak, but it’s time. Select the checkbox labeled: Make this version available on the command line. This should work just fine, as php is now aliased to the MAMP PHP version (step 3 above), which has intl install, and you’re specifying the PHP script directly, bin/cake.php, and together you’ll be able to bake all the CakePHP code you need. I updated to macOS Sierra 10.12 (GM) tonight and surprisingly everything seemed to work without any issues … at least so far. One thing that did come up, but was easily remedied, was that all of my SSH keys stopped working. The above command prompted for a password (assuming you use GitHub), which is should not do if SSH keys are set up properly. This lists all keys that the SSH agent knows about. After upgrading, this returned zero keys! Note: In reality ssh-add is session-based, and so each time you log in this command will show zero results (see below). -K tells ssh-add to save the key into your Keychain, so that on subsequent logins, even if ssh-add -l shows nothing, ssh will also look in your Keychain to see if the key is save there. That worked for me, though oddly I had to do this process twice as the first time I made it to step four, then exited Terminal, none of my applications using SSH worked, I opened Terminal again and found that nothing was listed when I ran the ssh-add list command. I saved the config file, and now my SSH keys work as expected. Specifies whether keys should be automatically added to a running ssh-agent(1). If this option is set to ``yes'' and a key is loaded from a file, the key and its passphrase are added to the agent with the default lifetime, as if by ssh-add(1). If this option is set to ``ask'', ssh will require confirmation using the SSH_ASKPASS program before adding a key (see ssh-add(1) for details). If this option is set to ``confirm'', each use of the key must be confirmed, as if the -c option was specified to ssh-add(1). If this option is set to ``no'', no keys are added to the agent. The argument must be ``yes'', ``confirm'', ``ask'', or ``no''. The default is ``no''. On macOS, specifies whether the system should search for passphrases in the user's keychain when attempting to use a particular key. When the passphrase is provided by the user, this option also specifies whether the passphrase should be stored into the keychain once it has been verified to be correct. The argument must be ``yes'' or ``no''. The default is ``no''. I eventually landed on the following inside my config file (~/.ssh/config), erasing everything I had added in the first UPDATE. Afterwards I restarted to flush anything in SSH and noticed that everything was working correctly again. At this point, it’s probably a good idea just to start with this, assuming you’re running at least macOS 10.12.2. Note: The above example I actually repeated three times since I have more than one SSH key that I need to use. Just copy and paste, being sure to update your private key filename. 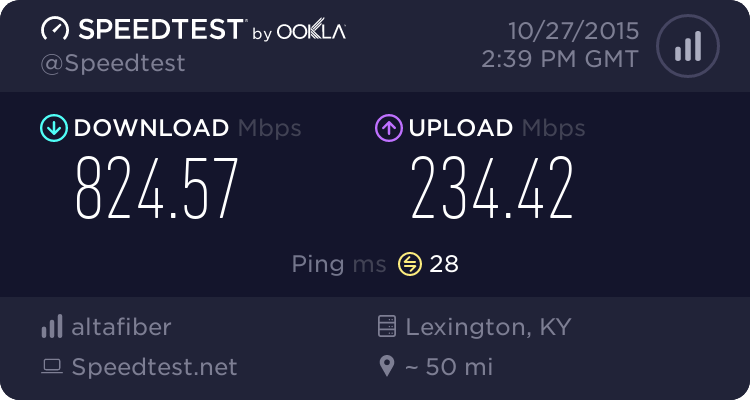 Just a quick note about Cincinnati Bell FiOptics Gigabit service, it’s pretty much fantastic. 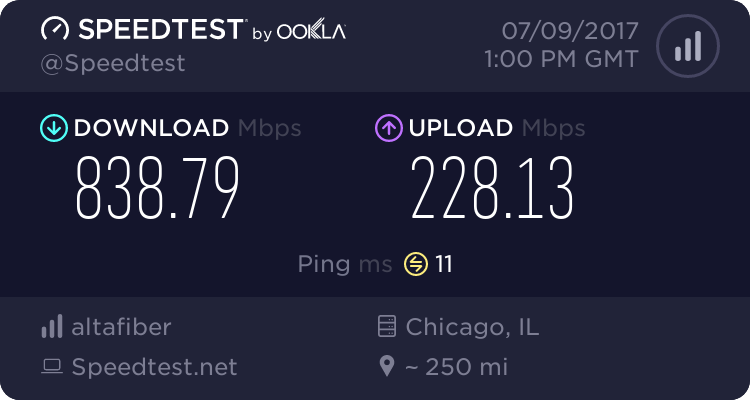 I ran this tonight (2014-10-06 23:16:45 EDT), and although I’ve had the download a bit faster (as much as 850 Mbps), this is still amazingly fast internet. 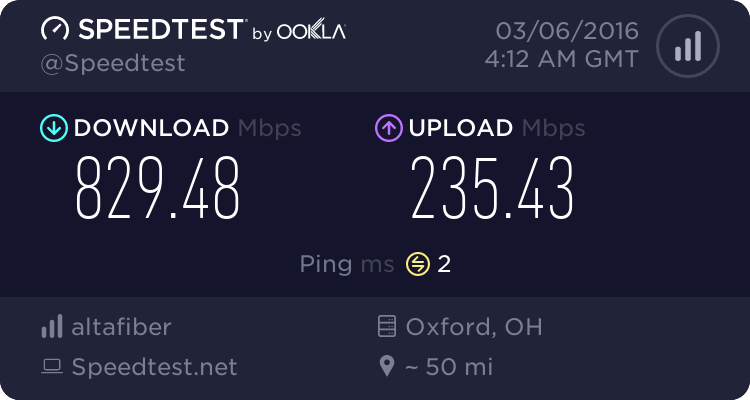 But one thing I think that’s worth mentioning, and something Cincinnati Bell does at least a decent job of doing themselves, is that you will not be able to achieve these speeds without hardware to support gigabit internet. Without actually looking it up, I would guess that most Macs built within the past 5 years (or so) have a gigabit Ethernet port. More recent PCs probably have this as well. But what will really trip you up is your network hardware. In my household we have a number of Apple Airport Extreme’s which have gigabit ports, both on the LAN and WAN ports. What I discovered, however, is that converting a WAN input (from the FiOptics 1 Gbps service) to a useable 1 Gbps LAN output is not as simple as making sure the WAN and LAN ports are the gigabit variety. The best my Apple hardware could muster is about 250 Mbps. I ended up referencing the following WAN to LAN chart in order to find a router capable of converting WAN to LAN at the full 1 Gbps. As you can see via my results above, accounting for overhead and some network congestion, I’m pulling (more or less) the 1000 / 250 Mbps connection I was told I could receive. I say “could” because they only guarantee 300 Mbps down … I’m not sure what an acceptable upload speed is. In summary, the speed is fantastic. 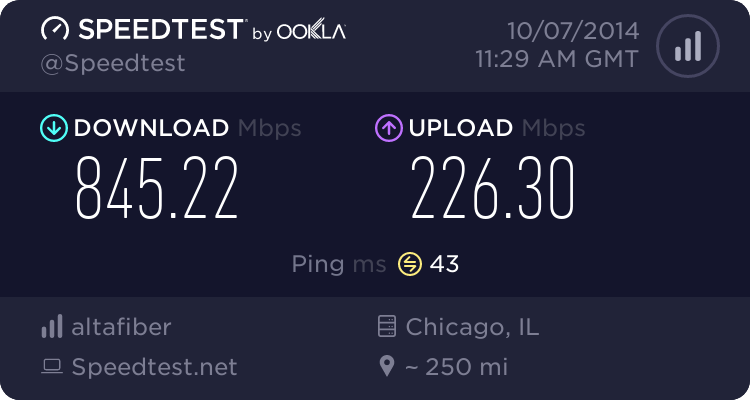 I found a Speedtest.net server in Chicago (Comcast, ironically) that would allow me to test at 1 Gbps. 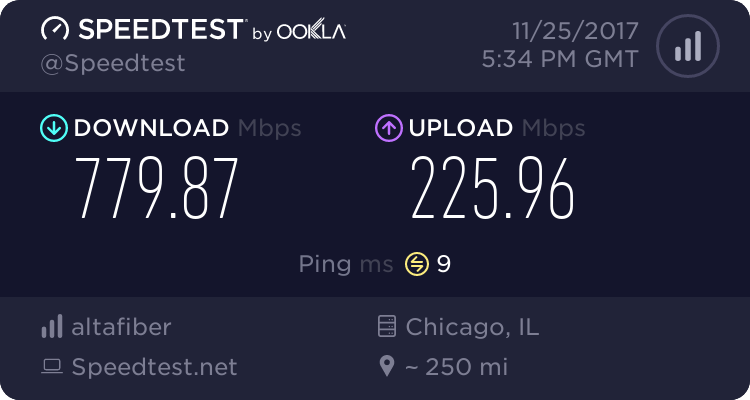 Speeds are as good, if not better, 6 months later. I see fiber lines going up (or already up) all over the city. If you can get FiOptics Gigabit service, I highly recommend it! While Speedtest.net speeds are still good, depending on the server you hit, you never see these speeds in real-world usage. Even big companies like Apple or Microsoft that use CDNs don’t allow (or cannot provide due to capacity constraints) much more than 100 – 150 Mbps. That said, most places will let you upload at almost full speed (~ 200 Mbps), which when compared to typical upload speeds of < 10 Mbps almost makes it worth it. Download and upload speeds still seem to be just as high as ever, though as noted before, one rarely sees these kinds of speeds unless downloading from multiple sources at once. During peak hours, I may still be able to pull over 500+ Mbps on a bandwidth test but have Netflix or iTunes on the Apple TV essentially have to buffer the content before I can view it. Something I’m interested to see pan out is comparing my 1000 / 250 Mbps service at home with my 100 / 50 Mbps service at the office. 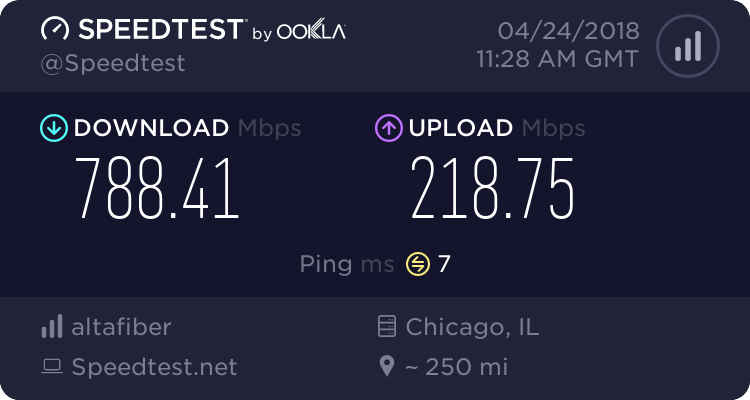 So far I haven’t been able to tell a big difference between the two speeds, but it is noticeable, especially when OS X or iOS updates are released and all the devices in the office are updating at once and the office connection becomes saturated. More of the same, which is certainly good news! The C rating for Top Speed is based on my own value of 1000 Mbps, though clearly I wasn’t, nor ever will, get anything near that speed in real-world scenarios. That’s inline with what I had been receiving, so I’m glad to see those sorts of results. FiOptics continues to be fast overall, though I’m still disappointed that some major providers cannot (or will not) transmit data more than about 100 Mbps. Services like Netflix are still essentially instant. The part I’m most used to day-to-day is that we can have many devices streaming or downloading (or uploading; backups) and no single device is ever affected by any another. For anyone that might be interested, when you take two FiOptics locations with similar speeds (my office being the other location; 500 / 125 Mbps) and connect them via a VPN tunnel, it feels as if everything is on the same local network. I have Ubiquti UniFi products installed at these two locations, so creating a VPN connection between locations is very easy. With that connection in place I can remotely control devices and have the same (lag) experience as if I were onsite. It’s an unexpected benefit that has proven very useful. I continue to recommend this service to anyone who is OK paying the price premium — it has been a solid decision thus far. This is an a holiday weekend, so I’m guessing the tubes are light this afternoon (12:34 eastern), but I felt the result was pretty superb considering I have Spotify streaming, and the TV is streaming PBS in the other room. I also realized that I’ve had gigabit service for three years now, and my only real complaint is that I assumed it would be cheaper now. At my location, I essentially have zero downtime, and I never notice any services being sluggish — though sometimes Netflix can take an extra second during the prime TV viewing hours. FiOptics gigabit is still something I would recommend! The other day I updated the AirPort Extremes in my house, resetting them to their default settings. When I had everything up and running again, I noticed they no longer flashed with activity. I searched through the AirPort Utility 6.x (6.3.2) installed on Mavericks and could not find this setting. I searched DuckDuckGo and found a lot of other people longing for this option, too. Since you cannot install (can you?) AirPort Utility 5.x onto Mavericks, I ended up installing 5.x onto my Windows 7 VM. There I was able to find the setting, make the change, and was happy again. But what if you don’t have a Windows VM? What if all you have is Mavericks? Well, I have an easy enough solution for you. In AirPort Utility 6.x, export your AirPort configuration file and save it to your desktop. Open this file with a text editor (such as Sublime or vim) and search for “leAC” (lower case L). Save the file, go back into AirPort Utility 6.x and import this configuration file. Don’t change anything else in your file, just the 1 into a 2. This tells your AirPort that you’d like it to “Flash on Activity”. Let the AirPort restart and take note and the wonder that is a flashing green LED. It seems this trick does not work on the latest Airport Extremes with 802.11ac. Even with the above set, the LED on the front of this device does not flash. I’ve been using Linode now for a few months, and I basically could not be more pleased with the service. Linode recently moved to newer and faster CPUs, as well as moving over to 100% SSDs. I never thought my Linode was slow before, but it certainly seems faster now. I’ve not run any benchmarks myself, but there are those that have, and the improvements are not small. It’s just been rock solid thus far. I moved some old websites running Perl code over to the new Linode instance. To my surprise, I rediscovered that this code is about 10 years old. I’m amazed it still works. And that’s the beauty of my Linode, or more specifically, Debian running on my Linode. I simply installed Perl and a handful of perlmods, and the sites sprang back to life. I don’t ever remember Linux being this easy to use. And so I have nothing but great things to say about Linode. While there have been a few outages I’m not pleased with, Linode posted regular status updates and was honest about what was happening. Otherwise, response times are down by 25% over the Mac mini server I moved from … and immensely faster for the sites I moved from DreamHost. If you’re looking for a VPS, Linode should be your final stop! After testing out Linode for the past week, I took some time this evening to migrate the bulk of my sites to my linode (what Linode calls their VPS instances). Using Linode this past week has been amazingly painless. Their management portal, while basic in appearance, has been adequately powerful for my needs. Creating an VPS instance, a linode, is super easy. Best of all is their help section, dubbed the Library. I was able to follow the basic steps to set up my linode with a new user account, locked it down, set up LAMP and had my first website up and running within probably 15 – 30 minutes of signup up. I needed to upgrade MySQL from 5.5.x to 5.6.x on my OS X server running OS X Mavericks (10.9) and I found a site that basically made it super painless. Nothing jumped out on my from Google regarding Mavericks, so this is really for that random person like me who was unsure how it should work. First, go download the 64-bit DMG of MySQL from here. Don’t worry that it says 10.7, it will work just fine with 10.9. Then go here and read this page … I’ll wait, but don’t follow all the steps until you read my next part. This will prompt you for your root password, but it will also allow the upgrade script to actually run. Otherwise, the directions were perfect and you should really have no problem. If for some reason you don’t have root access to MySQL … you’ll probably want to ask someone who does.